Immediate access to entire archive dating back to January/February 2005. Sample a recent Digital Edition, free for 24 hours. In July, 2011, the parent company of iSixSigma Magazine closed due to financial issues. On November 7, 2011, the founder of iSixSigma, Michael Cyger, purchased back certain assets. 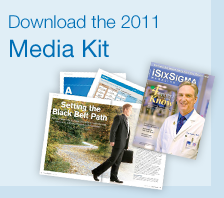 As of today, iSixSigma Magazine is no longer offered in print or online. Better By Design The Engine Division at John Deere Power Systems is using Design for Six Sigma to optimize its products. The Critical Inputs for Lean Six Sigma Success Using exclusive survey data, this report measures the critical inputs that impact Lean Six Sigma success. Improving Adverse Event Case Narrative Quality Improving the quality of narratives that describe adverse reactions to pharmaceutical drugs. Breaking Through What to do when your organization hits the wall - the point at which progress is halted for financial, operational or cultural reasons. Creating a DMAIC Pathway for Innovation The common Six Sigma roadmap can provide value in even the most unstructured environments. iSixSigma Magazine is the premier guide to successfully implementing Six Sigma. Every other month we deliver indispensable insights, profiles, methodologies, strategies, research and tools dedicated to helping its readers resolve today's business issues.